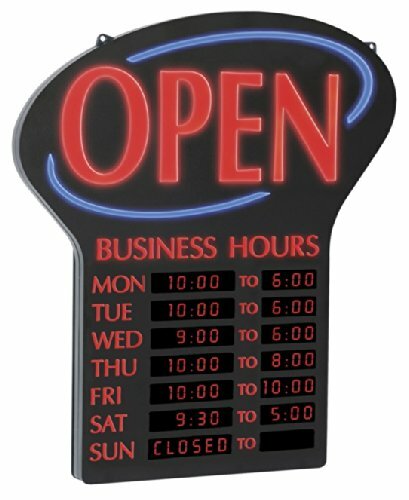 Newon LED-lighted OPEN signs are a great way to let customers know when you are OPEN. This sign features easy-program digital business hours that can be programmed in 30 minute increments. The hours are designed to stay lit at all times, so your customers know when you are open, even when the business is closed. The OPEN portion of this sign features a large 5.25-inch font which can flash or stay static. Highly visible and super bright, this sign is sure to attract attention. Newon gives you a neon sign’s look and stopping power in a safe package that’s brighter, cheaper to operate and far more durable. Newon lasts at least three times as long as neon signs. Their proven LED technology doesn’t generate heat or make noise. It’s also thin and light enough to fit in spaces no neon sign can. Newon signs are better than neon! If you have any questions about this product by Newon, contact us by completing and submitting the form below. If you are looking for a specif part number, please include it with your message.